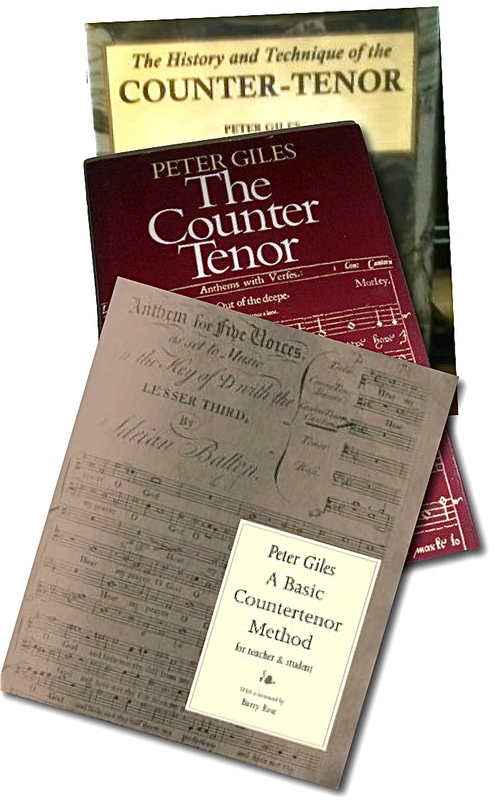 Peter Giles is the author of the acknowledged standard full-length works of reference on the countertenor voice. The Counter Tenor appeared in 1982. Original and full of insight at its time of publication, this volume has since been superseded by his later work The History and Technique of the Counter-Tenor (Scolar Press/Ashgate 1994). 1987 saw the appearance of A Basic Countertenor Method (Thames Publishing). A revised edition followed in 2005 (Kahn and Averil). Les Contreténors: Mythes & Réalitiés was published by harmonia mundi in 1999. Most of these publications can be found online via outlets such as www.bookdepository.co.uk, www.amazon.co.uk and www.barnesandnoble.com. Rare, mint-condition copies of the first edition of A Basic Counter-Tenor Method are available from the author at a price of £14.95 plus p. & p. Click here to enquire. In addition to his books Peter contributes articles on voice and writes reviews and CD inserts. Notably, he wrote the section ‘Countertenor’ and rewrote that on ‘Falsetto’ for the Millennium edition of The New Grove Dictionary of Music and Musicians. He has scored many arrangements for voices, usually for performance by unaccompanied small ensembles. A number of these pieces, for alto, tenor and bass, were issued by Thames Publishing (now Elkin) in the 1995 collection Three Men’s Song. Peter’s Stabat Mater was published in two versions – alto/tenor/bass and two sopranos/alto – by Oecumuse in 1986.